Carbon-zinc dry cells (sometimes referred to as non- alkaline cells) have an emf of 1.54 V, and they are produced as single cells or in various combinations to form other voltages. (a) How many 1.54-V cells are needed to make the common 9-V battery used in many small electronic devices? 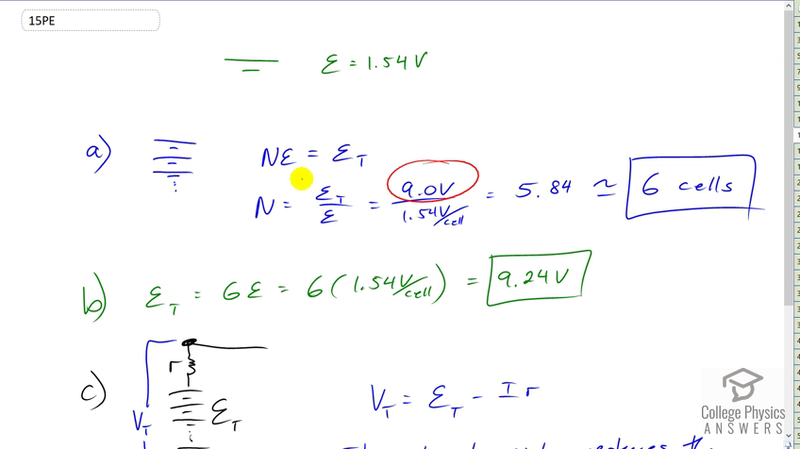 (b) What is the actual emf of the approximately 9-V battery? (c) Discuss how internal resistance in the series connection of cells will affect the terminal voltage of this approximately 9-V battery. The internal resistance reduces the terminal voltage. This is College Physics Answers with Shaun Dychko. A Carbon Zinc dry cell has an EMF of 1.54 Volts. And if you want to make a nine Volt battery out of cells composed of cells that are 1.54 Volts each, then you’re going to need to multiply the single cell by the number of cells to make the total of nine Volts. And so we have them stacked up on top of each other. This is why batteries are called battery, ‘coz the word battery means whole bunch of things stacked together or a collection of things. So a battery is a collection of cells. So we divide both sides by the EMF per cell and we get the total EMF divided by the EMF per cell is nine Volts divided by 1.54 Volts per cell which his 5.4. And since you can’t have part of the cell, we’re going to need to have this six cells. Now the terminal voltage, or the term of EMF I should say, they’re going to be six times the EMF of per cell. And we’re going to end up with 9.24 Volts. Slightly higher than the nine Volts that we wanted because we had to round this number up to six. Now when this is connected to the circuit, this current being drawn from this battery and the current that will go across the internal resistance which is, it’s not as though they put a real resistor in there. It’s just a way to model the idea that there’s a limit to the rate of the chemical reaction that occurs within the battery. So the terminal voltage that will be measured between the terminals of the battery will be the EMF that we calculated minus the current being drawn multiplied by this internal resistance. And so the internal resistance reduces the terminal voltage to some number below the EMF.